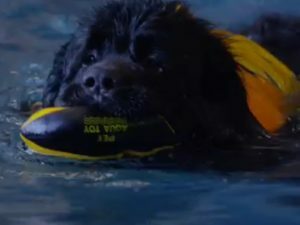 After a diagnosis of Osteosarcoma, three legged Newfoundland Bucklersbury Bear has found a new lease of life in the water, swimming wherever and whenever he can. He’s inspiring to all those who meet him, not least to his family, who’ve adapted their lives for him and his passion for the water! When Noel first met Bucklersbury Bear, he had cancer affecting one of his front legs. It was an aggressive cancer and was eating away the bone. Noel advised that trying to save his leg was not in his best interests and he therefore recommended amputation of all of the leg including the shoulder. 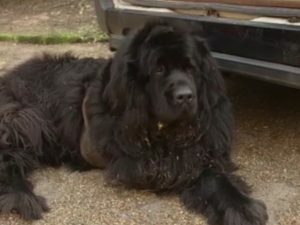 It was a tough decision for his family, who knew that for such a large dog, a life on three legs might present increased challenges due to the weight he would have to bear on three, instead of four legs. However, following a chat with Noel they felt that they wanted him to at least have a chance. Noel discussed all of the options with them including euthanasia. Everybody wanted to do what was in his best interests. Desperately in love with their dear friend, they had no trouble in deciding that they wanted to give Bucklersbury a chance at life. Since the day they decided this, the family have adopted their life for Bucklersbury, adjusting their home to help prevent injury due to slipping, and keeping a close eye on him. Sessions of Hydrotherapy were necessary for Bucklersbury to build strength in his remaining limbs, as exercise on the ground was now harder for him. He took to the water beautifully, and now has a new lease of life as he takes to the water, and his family take every opportunity to allow him this great pleasure! He and his family are an inspiration to all that meet him. Their story shows that despite an uncertain outlook, life is still a light worth holding on to, and though Bucklersbury is one limb less, his vitality for life and the love of his family are an amazing example to all of us. I believe I am here on the Earth to look after all animals and to try my very best to provide them with the best possible quality of life. Sometimes this isn’t possible or morally right for that animal and in such circumstances, euthanasia needs always to be considered, as difficult as it may seem. We cannot in my view hold on to an animal’s life for ourselves; it has to be for them. Every decision must be in their best interests. In the case of Bucklersbury I discussed all of the options, as I always do, and his family decided to proceed with full limb amputation. I have seen loads of dogs of all shapes and sizes do really well on three legs. As in Bucklersbury’s case, bodyweight can be a challenge, but it does not preclude many from having an excellent quality of life on three legs, especially with a supportive family environment. Sometimes it’s right to consider saving the leg and sometimes not. What’s important is to give all of the options all of the time and work together to achieve the best possible outcome. It brings me and my team and indeed so many other people so much joy to see Bucklersbury swimming and getting on with life. When life gets us down, as it often does, he’s like a big fluffy Bear of black brightness! This is the brightness of hope and of faith even in times of great sadness. He has defied the odds and survived more than a year. That’s incredibly special time here on Earth – because we sometimes forget that we are all just passing through – and it’s very important that we look after each other and look after the animals whilst we’re here. Thank you Bucklersbury and thank you to his family for sharing their hope, their faith, their determination and their happiness with us.